Derek Dukes was on net@nite #53 the other week, and it was really interesting to hear him talk about dipity. Dipity is an experiment in information organisation, with time being the primary dimension currently being explored. Similar in a way to MIT's SMILE widget, which I was investigating a while back for visualizing time-based information. 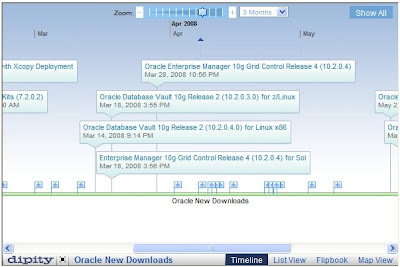 Ulrich has already worked up a history of Oracle Releases. Not complete, but a fantastic visualisation that would be worth supporting and maintaining! NB: I'm posting a static image here for now, because the embed code doesn't seem to work in all browsers at the moment.